The CLEARLINK™ (SEND) LINE DRIVER is designed to compensate for losses in Tone due to increased capacitance in long cable runs. With a high quality buffer and +12dB of available output gain, it has the ability to drive cable runs of up to 330 Ft./100M before noticeable degradation, when added in-line on the feed from Pedal Board to Amplifier. When combined with a STOWAWAY™ INPUT BUFFER on the Instrument, the CLEARLINK SEND forms an “Effects Loop” for the Instrument-Pedal Board-Amp signal chain that will reclaim the integrity of your sound through boosted levels and buffering or impedance matching. Whether used by itself, or with the STOWAWAY as a comprehensive “Front End” solution, it will provide the needed “stable impedance source” to ensure the pieces in your rig “communicate” well. It can be used for balanced signals via two different output jacks; standard 3-pin XLR or ¼” TRS. It also supports unbalanced signals via the standard ¼” mono jack. If you’re going to send your signal on a marathon, make sure you have a clear link to communicate… because you don’t want your Tone lost in translation. Output Level Control - Adjusts the Output Level of the integrated line-driver circuit, from Unity to +12dB. Balanced XLR Output – Drive cable runs up to 330ft with unsurpassed noise immunity and signal integrity. 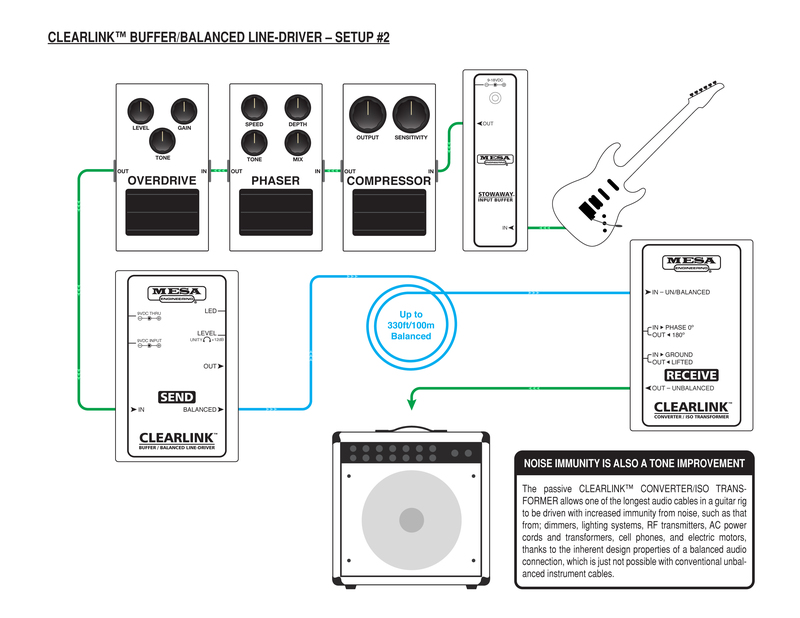 Can I use the CLEARLINK™ SEND BUFFER/BALANCED LINE-DRIVER for my bass? Some of these SMPS adapters are noisier than others, especially those that aren’t from a reputable or brand-name MI manufacturer. Another reason could be that you’re trying to run to many devices from a single adapter. Though many of them have a high current output and tout being able to power many devices, doing so can result in the development and/or increase of noise, for some reason. If this is happening, we recommend either trying another adapter, or better yet - using a universal pedalboard power supply with enough isolated outputs to power every device on your pedalboard individually; better power = less noise = more tone! What’s the maximum length of cable that the CLEARLINK ™ SEND BUFFER/BALANCED LINE-DRIVER can drive? Why wasn’t a transformer isolated output provided, for splitting or ground loop elimination applications? 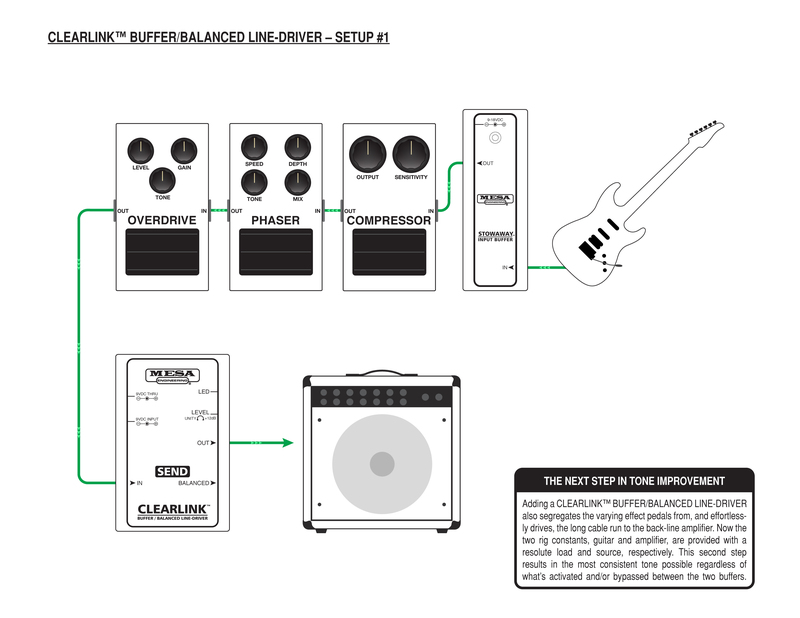 Can I plug my guitar directly into the CLEARLINK™ SEND BUFFER/BALANCED LINE-DRIVER, using it as an input buffer at the start of my pedalboard? Theoretically you could, but we have another device which is much better suited as a guitar input buffer, the STOWAWAY ™ INPUT BUFFER. It is a 100% discrete Class-A circuit with an input impedance and other finely tuned characteristics which mimic that of a high quality tube amplifier, and it includes an RFI filter to minimize the possibility of radio-frequency interference and noise. It presents a dynamically ideal load to a guitar that remains steadfast, resulting in a tone that is consistent, while still allowing the guitar to breathe, live, and react - like plugging directly into the front of a tube amplifier. Alternatively, we also have a two-in-one device called the HIGH-WIRE™ DUAL BUFFER / OUTPUT BOOST which includes both circuits, plus a boost and tuner mute. Using the CLEARLINK™ SEND BUFFER/BALANCED LINEDRIVER in tandem with a STOWAWAY™ INPUT BUFFER resolves the deep-rooted signal loss and inconsistent tone issues faced by guitarists due to; capacitive loading, impedance loading and mismatching, and changes to a pickup’s resonant frequency/peak, as a result of varying effect pedals and interconnecting cables. They accomplish this by providing the two constants in every guitar rig, the guitar and amplifier, with a resolute load and source, via the STOWAWAY™ and the CLEARLINK™, respectively. The two form an effects loop, which segregates the guitar and amplifier from the variables on a pedalboard, easily handles many pedals, interconnecting cables, and effortlessly drives a long cable run to the back-line amplifier, either balanced or unbalanced. As a result, the only variations in sound and tone will be from the actual effect of the pedals on the pedalboard, and not from a guitar or amplifier related loading or impedance mismatch issue.